It was the tiny Himalayan kingdom of Bhutan that sounded the alarm: Chinese soldiers had arrived with bulldozers and excavators, and were building a high-mountain road near India’s border — in an area the two nuclear-armed Asian giants have disputed for decades. India responded to the call by sending troops last month to evict the Chinese army construction party from the Doklam Plateau. Within a few days, Indian media were running leaked video footage of soldiers from both sides shoving one another atop a grassy flatland.The tense standoff has only escalated since then, raising concerns in both capitals of an all-out military conflict. Both sides have made threats while simultaneously calling for negotiations. The U.S. State Department has urged the two sides to work together toward a peaceful resolution. India, taken aback by the escalation, has said the two governments reached an agreement in 2012 that the status of the Doklam area — which falls between China and India on a Bhutanese plateau — would be finalized only through joint consultations involving all parties. India and China have faced off frequently since fighting a bloody 1962 war that ended with China seizing control of some territory. Troops from both sides still regularly patrol other unmarked territories, though neither side has fired any shots in decades. Negotiations since 1985 to settle the boundary dispute have seen little success. The land they’re currently arguing over spans 269 square kilometers (104 square miles) on a sparsely populated plateau in western Bhutan, which has no diplomatic ties with China and coordinates its relations with Beijing through New Delhi. But India and China have rival claims to other Himalayan areas as well, including 90,000 square kilometers (35,000 square miles) in what India considers its state of Arunachal Pradesh and China refers to as “Southern Tibet,” as well as 38,000 square kilometers (15,000 square miles) of another plateau called Aksai Chin. Bhutan said the road China has been building would run from the town of Dokola to the Bhutanese army camp at Zompelri.Bhutan’s foreign ministry called it a “direct violation” of agreements reached in 1988 and 1998 to maintain peace and refrain from unilateral action in the area pending a final border settlement. “Bhutan hopes that the status quo in the Doklam area will be maintained,” it said in a June 29 statement. Chinese foreign ministry spokesman Lu Kang said last week that India’s border guards, in responding to Bhutan’s call for help, had “illegally trespassed the boundary into Chinese territory” when they confronted the Chinese army construction team. For India, securing the Doklam Plateau is seen as essential to maintaining its control over a land corridor that connects India’s mainland with its remote northeastern states. India has said the Chinese road project threatens its access to the corridor, while China has questioned why India should even have a say in a matter that concerns only Beijing and Bhutan. India’s army chief warned earlier this month that India’s army was capable of fighting “2 1/2 wars” if needed to secure its borders. The dispute was discussed briefly without resolution by Chinese President Xi Jinping and Indian Prime Minister Narendra Modi on the sidelines of the G-20 summit earlier this month in Hamburg, Germany. It is expected to be taken up again when Indian National Security Adviser Ajit Doval visits Beijing for another security forum on Thursday and Friday. The Doklam standoff is just the latest of many irritants dogging relations between the world’s two most populous nations. 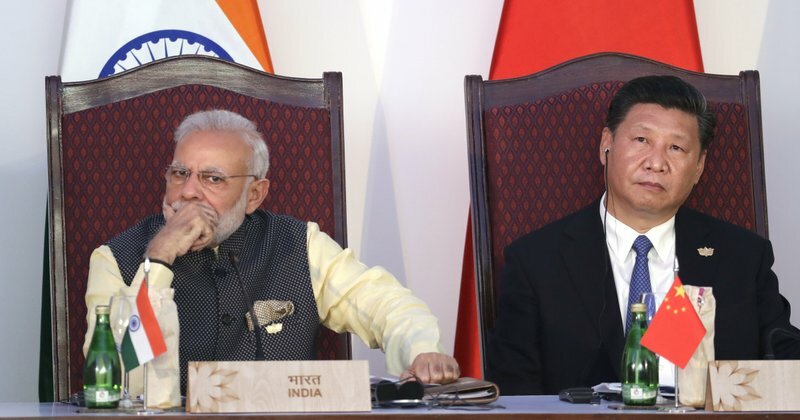 For years, India has watched uneasily as China vigorously wooed Bhutan and other, smaller countries in India’s traditional sphere of influence, including Nepal, Sri Lanka and Myanmar. “This is not the first time that we have a standoff with China,” said foreign affairs analyst and retired Indian diplomat G. Parthasarthy, predicting there would likely be a period of stalemate followed by a political compromise if the current tensions follow past patterns. “China is in an ultra-nationalist mood of establishing a hegemony power in Asia,” he said. 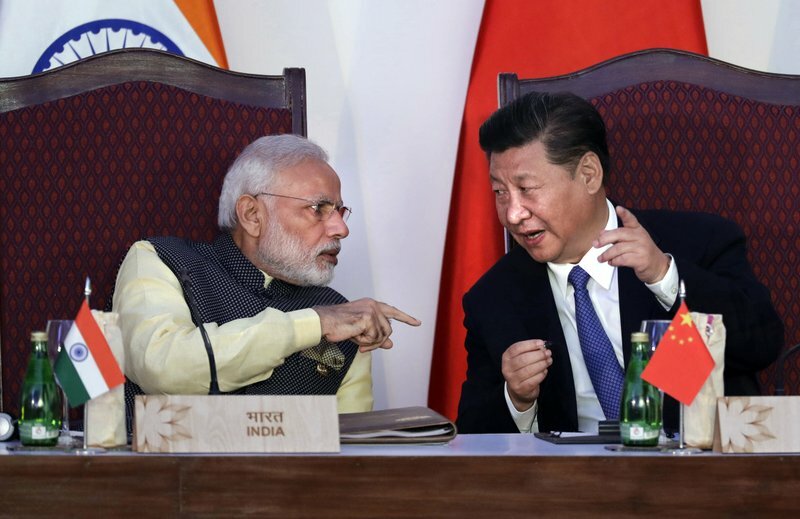 “The best thing for China is to sit down and talk.”China, meanwhile, has been frustrated with India’s refusal to sign onto a massive effort to build railways, ports and roads reaching from Asia to Europe and the Middle East. The project includes a China-Pakistan economic development program aimed at absorbing as much as $46 billion in investment, most of it from Chinese banks. China also has complained bitterly for decades over India’s accepting the Dalai Lama as a refugee in 1959. The Tibetan Buddhist spiritual leader has kept his headquarters in northern India since fleeing Chinese-ruled Tibet. Despite their disagreements, India and China entered a trade agreement in 1985 and have stepped up cooperation in agriculture, science and cultural exchange. But a $46.6 billion trade deficit favoring China has irked Indian members of parliament, who call regularly for more balance.